Dental bridges are sometimes necessary in dental patients, and it’s not an uncommon procedure. Our dental professionals have ample knowledge and experience when it comes to dental bridges, and that why we are a dental bridges dentist with a great reputation in the Utah area. When something happens to your oral health, whether it was damage from an accident or crash or years of poor oral health finally resulting in the worst, we can help. When you’re missing a tooth, smiling isn’t something you want to do. This affects your mood, your confidence, and your ability to become more successful in life. Talk to us about bridges. Dental bridges dentist offices like ours specialize in beautiful smiles. When yours is no longer or it no longer feels as good as it once did, we can help you improve your smile and get back to being yourself once again. 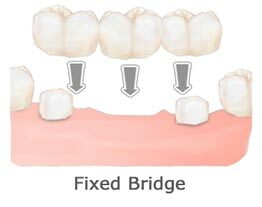 We fix bridges to the mouth to help you in the long-term. These are not temporary solutions to missing teeth. They last for the long-term, which makes it easier for you to smile with confidence and the assurance your teeth look great. Our office has numerous bridges from which to choose. We want our patients to have options that relate not only to the look of their bridges, but also the cost and the feeling of the bridge in their mouth. You get to choose how your bridges are going to look and feel, and we work with you every step of the way. From fitting them into your mouth to having them custom-made for every patient, we ensure a quality fit and a long-lasting product. Our dental staff works with each patient to teach you how to properly care for bridges so they are guaranteed to last a lifetime. Dental bridges take a while to place, and it’s usually a three-visit process. During the first visit, patients are x-rayed, examined, and they work to come up with a comprehensive plan by choosing their materials and the course of the next two appointments. During the second appointment, your teeth are reconstructed, shaved in some cases, and the dentist makes impressions so the custom bridges can be constructed to fit your mouth. We send these to a specialty lab, and they work on your new bridges. During the third appointment, we place your permanent bridge. It’s affixed with a cement that molds your teeth and stays put in your mouth. The entire process takes approximately two weeks from start to finish, and a temporary bridge is offered to all patients before their permanent bridge arrives. Don’t wait to have a beautiful smile once again. Help yourself feel more confident by calling a family dentist with knowledge, experience, and with the ability to help you feel happier and more beautiful in a matter of weeks. You deserve to smile your best smile.